These two handmade custom designed bi-hinged doors were made by Don in his studio. 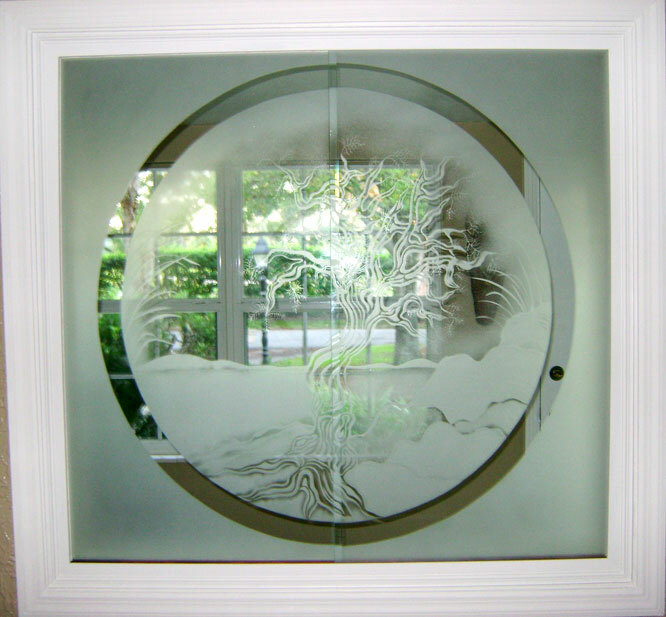 The two tempered etched glass panels form one graceful image titled "wind swept". All of the hardware is hand rubbed bronze finish for richness. The doors are pre painted in the studio to match the homeowners existing interior wood work. Gazing through these two 1/4" tempered, etched glass panels give a sense of movement. This design was inspired by trees viewed by Don on both the Atlantic and Pacific coasts, also gives you a feeling of strength with grace. The panels are housed in a special designed track system made entirely out of wood. The bottom was machined out of COCOBOLO heartwood from Central America. It's steel-like hardness in conjunction with the natural oils makes it ideal for sliding the glass panels on its slick surface with little effort. The circular design; well you may be viewing it through a port hole on your sailing vessel named "WIND SWEPT".